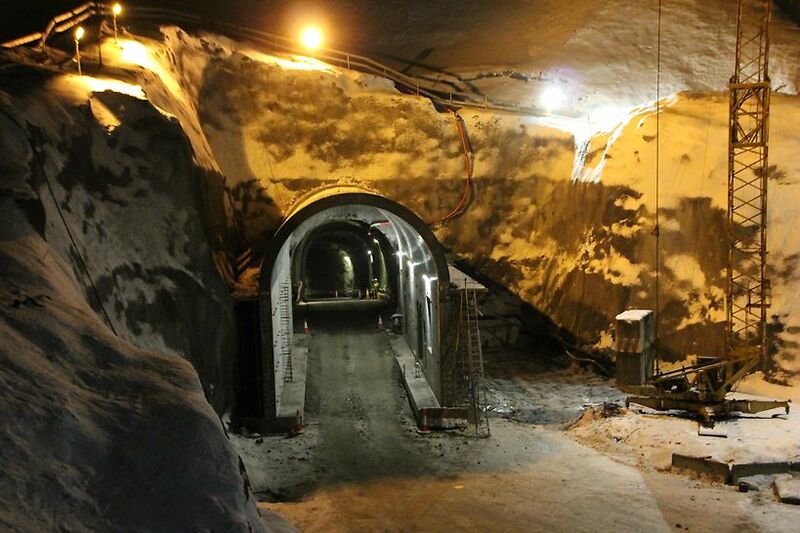 Purpose: A tunnel to provide access to the new powerhouse. 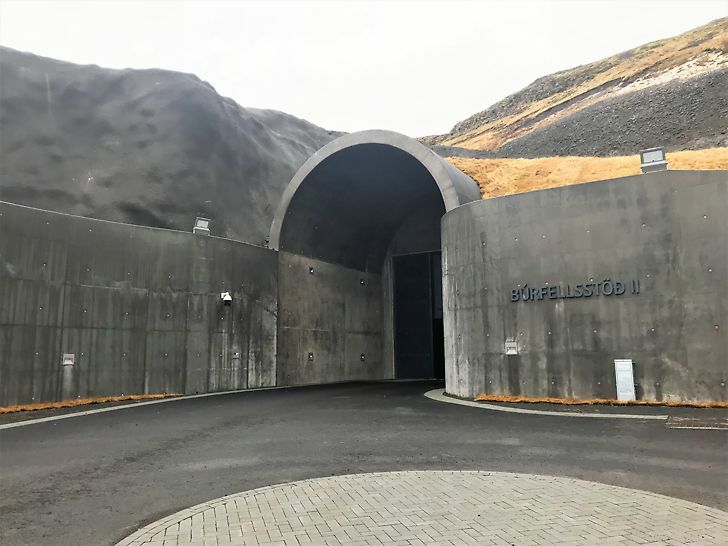 The power plant alongside Búrfell mountain has been in operation since 1969 and is currently undergoing extension work. 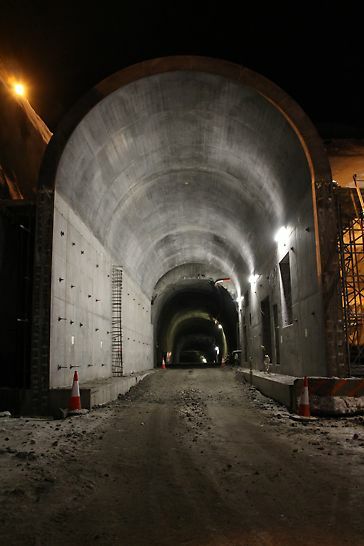 As part of the project, an access tunnel to the new powerhouse was required. 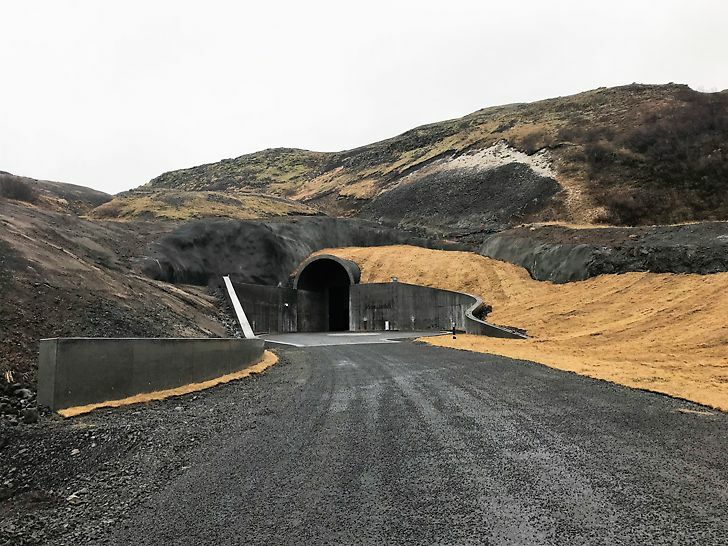 ÍAV required a project-specific and cost-efficient solution for the tunnel roof, stretching close to 26 m.
Two parallel 5.3 m high tunnel walls were concreted first using TRIO panel formwork. PERI UP scaffolding was then erected against the inner side of both walls in order to sustain the vertical load that would later be exerted by the roof. RCS rails were integrated with the scaffold system to act as clearspan beams over the live site traffic route. 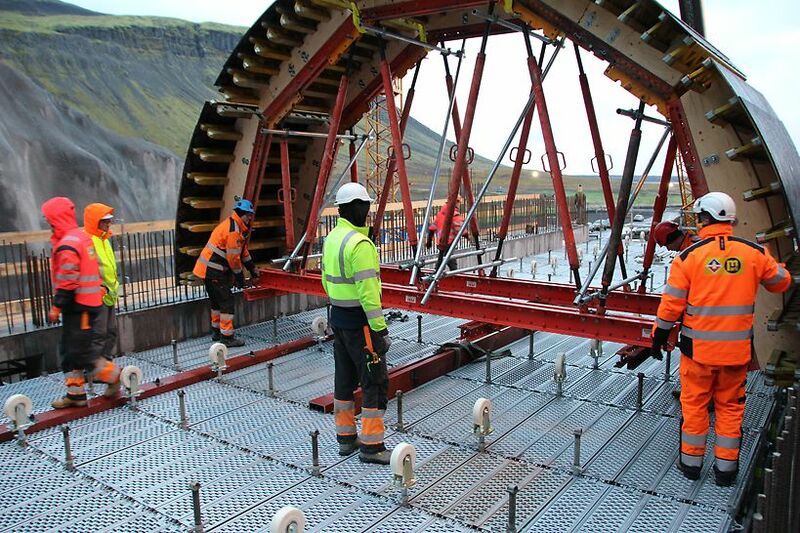 The rails supported the upper formwork loads, transferring them to the supporting legs of the scaffolding. PERI UP Flex platforms were secured at the top of the scaffolding system, spanning the entire length and width between the two walls in order to provide a safe working platform. Based on a 25cm modular grid, PERI's deck system provided a platform that was free from gaps or make-up areas. Inverted castors were then positioned into the upward-facing legs of the scaffolding system, providing support to the inner formwork during repositioning between pours. The roof was concreted in three consecutive pours using VARIO panel formwork. 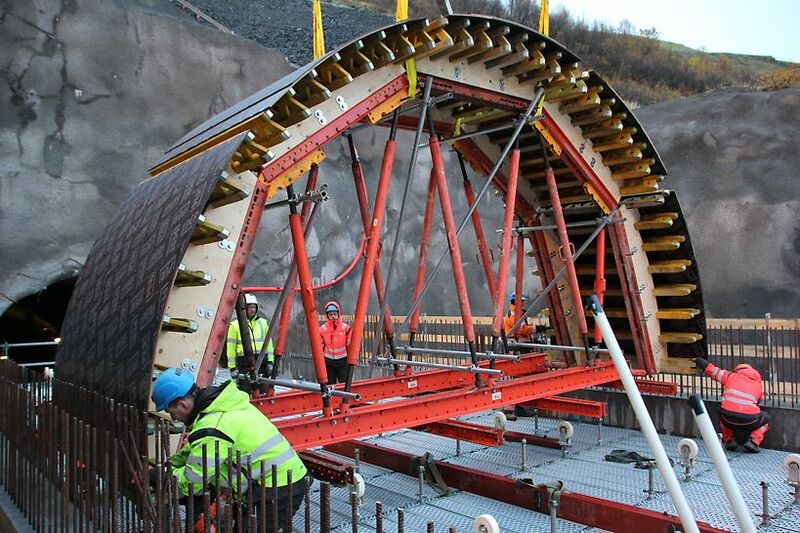 For the inner arc of the tunnel, GT24 girders slotted into 38mm laser-cut firring pieces which were supported by SRU steel walers. Twin layers of 9mm plywood sheets were then curved over the girders to create the desired shape and enable a smooth concrete finish. Vertical loads were transferred from the radiused panels into the RCS rail formwork chord at the bottom via adjustable steel SLS spindles. The outer formwork comprised a similar arrangement as 38mm plywood firring cross pieces supported 9mm twin plywood sheets. 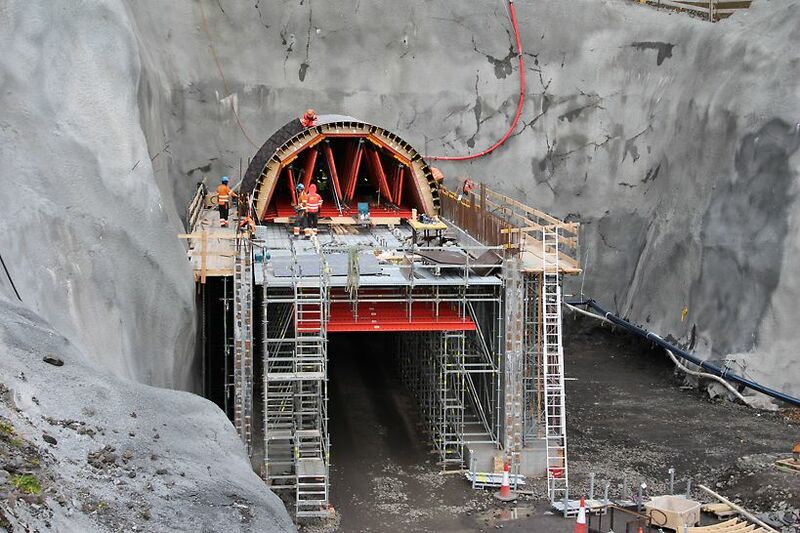 The outer and inner formwork panels were then connected using Dywidag ties, ready for the pours to take place. Two inverted steel channels were employed to facilitate the movement of inner formwork which travelled along the inverted castors.